GoodFirms disclosed the insights with the help of shopper and app makers to build a successful ecommerce website. WASHINGTON DC, WASHINGTON, UNITED STATES, April 11, 2019 /EINPresswire.com/ -- In today's highly competitive market, ecommerce platform is playing an essential role by assisting the businesses to develop an e-store and sell their products and services to the customers. Many of the entrepreneurs have invested in ecommerce to grow their business and earn profit from the online store. But most of them are facing challenges in running their ecommerce website. 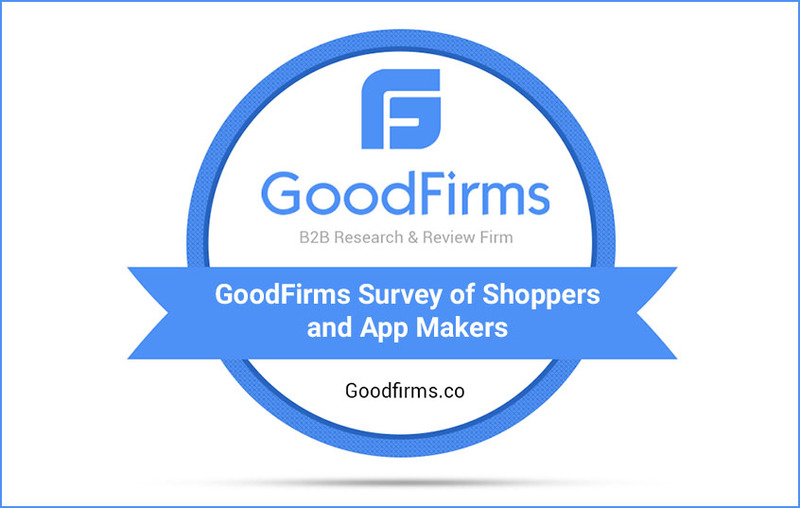 Thus, to solve this issue, GoodFirms had conducted a Detailed Survey of Shoppers and App Makers. In this research 250+ shoppers had participated from across the globe. With the help of their informative answers regarding the purchase cycle, it gave a clear idea to the ecommerce site owners what kind of different features shoppers are looking forward in their shopping experience. Apart from this, GoodFirms also surveyed ecommerce app makers from iPhone and Android platform. There were numerous ecommerce app development companies that enrolled themselves in this research from different countries like California, Canada, India, Russia, Ukraine, and the United States. With the help of this profound analysis, GoodFirms was able to reveal the average cost of developing an ecommerce app, the factors affecting ecommerce app development cost and average time to develop an online shopping app. Additionally, GoodFirms is a globally renowned B2B research, ratings and reviews platform. It endeavours to associate the service seekers with best partners for diverse project development and software needs. Here at GoodFirms, you can reach the Top Ecommerce Development Companies from worldwide that are listed based on several qualitative and quantitative methodologies. The research team of GoodFirms performs an in-depth assessment which includes three main factors that are Quality, Reliability, and Ability. Further, these key elements integrate with many other statistics such as verifying portfolio to understand the background of each company, years of experience in the expertise area, solid market penetration, and client feedback. Considering the all above statistics every company is compared with each other and indexes them in the list of top companies as per their categories. Presently, GoodFirms has also cultivated a new catalogue of Top Mobile App Development Companies from across the world for their integrity and ability to deliver innovative apps to their clients. Furthermore, GoodFirms supports service providers by asking them to engage in on-going research. Show the evidence of strong work record and hence, grab a chance to get listed in the list of top development companies, best software, and excellent firms from varied segments. GoodFirms is a Washington, D.C. based research firm that aligns its efforts in identifying the most prominent and efficient ecommerce development companies that deliver results to their clients. GoodFirms research is a confluence of new age consumer reference processes and conventional industry-wide review & rankings that help service seekers leap further and multiply their industry-wide value and credibility. GoodFirms is a Washington, D.C. based research firm that aligns its efforts in identifying the most prominent and efficient IT companies that deliver results to their clients. GoodFirms research is a confluence of new age consumer reference processes and conventional industry-wide review & rankings that help service seekers leap further and multiply their industry-wide value and credibility.